The two weekends prior were spent rafting 50+ miles of the Deschutes River through Eastern Oregon and a Mt Shuksan Summit + Fire Lookout Sleepover and the upcoming two weekends are packed with the wedding of two fantastic people in Idaho followed by a 4 day Trek along the rugged Washington coast of the Olympic Peninsula. So with less than 6 months before we need to be living in SHED and a month of that used exploring the PNW we spent this last weekend covering as much ground as possible, primarily installing our shower unit and our siding. We couldn’t find much detailed information regarding the installation of a through floor shower drain so we thought we would detail our process out here which we found relatively painless and left us feeling both proud and confident of the outcome. We had already decided that we did not want to run any plumbing lines inside our floor (in case of leaks) and opted to have all of the drain plumbing below the trailer as we have seen in other THOW but we wanted to add the option to “quick disconnect” the plumbing lines during transportation. 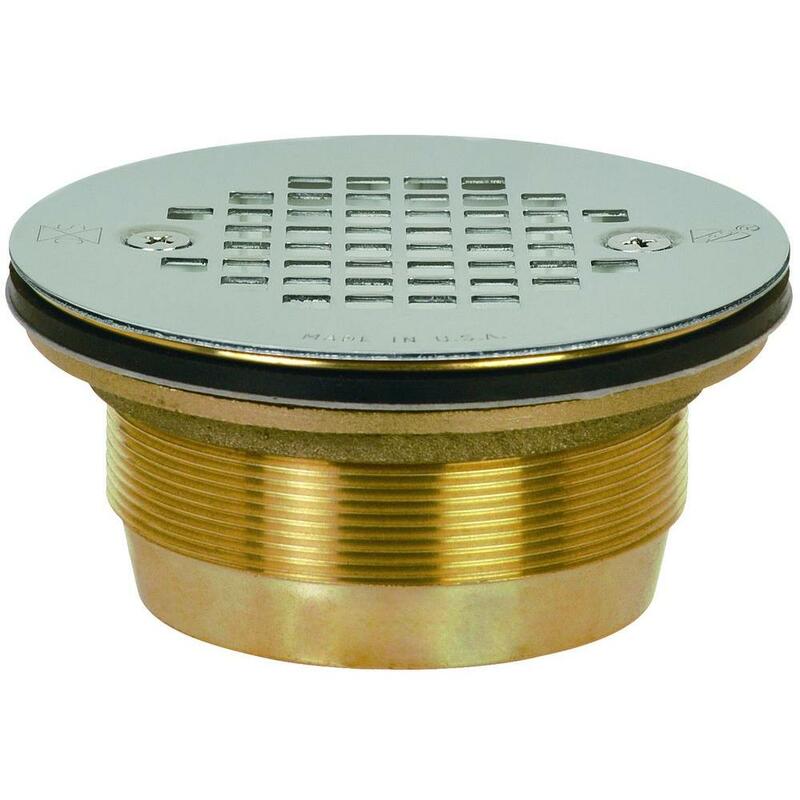 We used the below brass floor drain fitting and a quick disconnect threaded PVC coupler to achieve this. (note: Our composting toilet will eliminate the need for a black water sewer drain, leaving us with 3 grey water drain lines through the floor, from the shower, bathroom sink and kitchen sink. 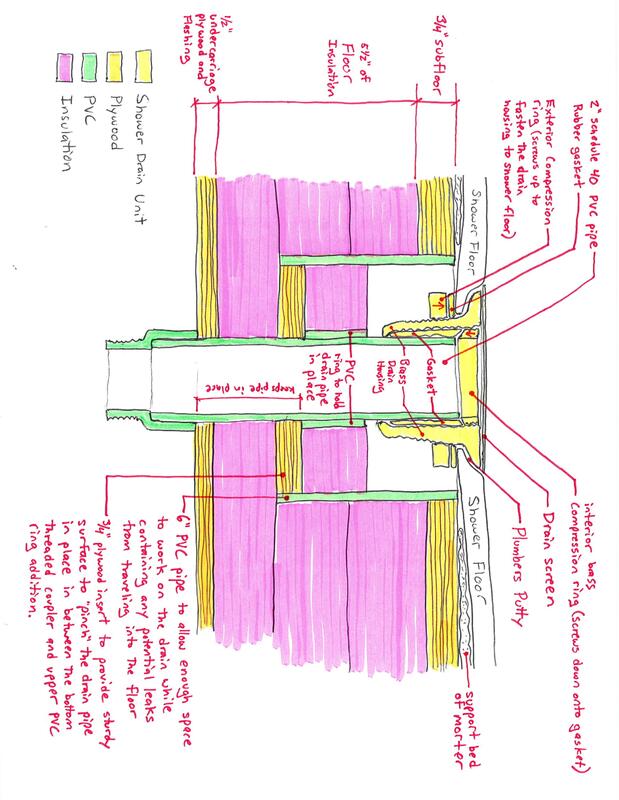 The detail sketch above will hopefully make it easier for you to understand our floor construction and the ensuing drain penetration through it. Before ever getting to the dreaded hole through the floor (our first of 3) we put up wood panels to the framing around the shower to create a separation between the shower and the gear room on one side and the shower/bathroom and the main living space on the other side. We also added rigid insulation in between the studs on the exterior wall as we will do throughout the entire house later. After setting and leveling the shower unit in place we traced its outline and the shower drain location before removing the unit and getting down to work. The first hole all the way through the floor was 2 3/8” in diameter, just big enough to allow the 2” schedule 40 PVC drain pipe to pass all the way through from inside to outside. Then we traced and cut a 6” diameter hole through just the subfloor and 4” of insulation with a jig saw. Similar to when a larger diameter pipe is used to “box out” a plumbing rough-in for a slab on grade or basement concrete floor. Using plenty of adhesive sealant, we then inserted the 6” diameter PVC pipe so that the top was flush with the top of our subfloor. In order to get the pipe to keep from moving, the original wood disk that was cut out from our subfloor was trimmed down in order to fit back inside the 6” box-out pipe and snuggly around the 2” drain pipe creating yet another (with lots of adhesive sealant) containment barrier in case of a leak. We did this so that there was a firm surface for a PVC slip ring to push against and counteract the force from the ledge of the PVC coupler that was pressing firmly on the undercarriage plywood/flashing thus causing the whole drain pipe assembly to remain stationary. The result is a threaded pvc stub that sticks out 2+” from the undercarriage of our trailer that will accept a specialty coupler (Not Drawn) that with a few turns of the wrist will release the under trailer plumbing lines from the 3 drain stubs. I forgot to take photos of the underside but will do so when installing the under trailer plumbing. Next we attached the brass shower drain housing to shower unit opening. This was done by slipping the housing through the top of the hole until it sat flush in the drain opening and then screwing the exterior compression nut on from the bottom until it tightly compressed the gasket ring against the underside of the shower unit and the drain housing did not move any more. We decided to lay down the optional yet frequently recommended bed of mortar to support the key areas where a single piece shower unit is most likely to crack or fail under weight and use which is often where the floor curves up to become the unit wall. 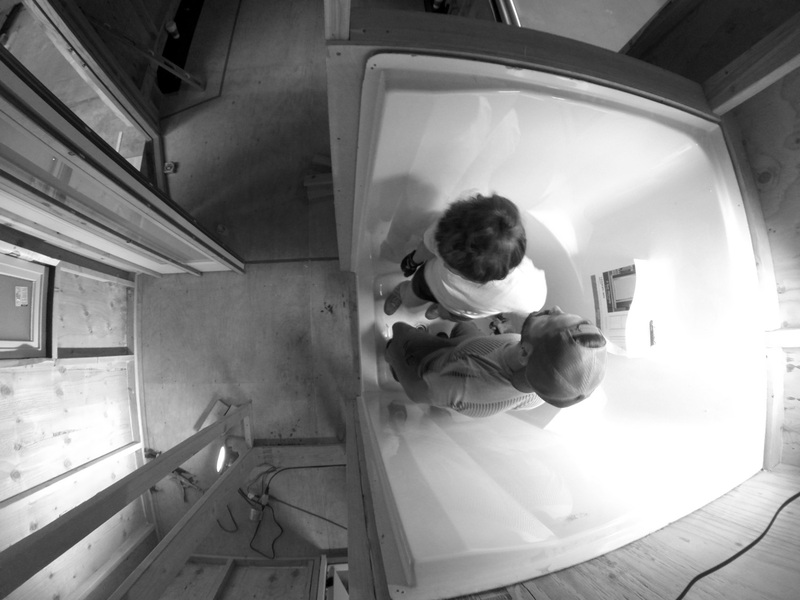 Once the mortar was in place we moved the shower unit into the alcove and carefully tilted it into place, allowing the shower drain housing to slide over top of the 2” PVC pip that was protruding from our floor. You may notice that this took a few tries in the time-lapse video, not because of the drain but because we needed to adjust the mortar to make sure it was supporting properly but not keeping the shower from returning to its perfectly level position which we had marked out on the walls during the dry fit. Once the shower sat flat the last step was to put the rubber gasket and interior compression ring back into the drain housing where they fit tightly between the outside of the 2” PVC drain pipe and the inside of the drain housing that wraps the top of the pipe. By tightening the compression ring down it forces the ring gasket to bend and expand against all surfaces, creating a watertight seal. We are also making progress on our siding which as you can probably guess is taking longer than expected! 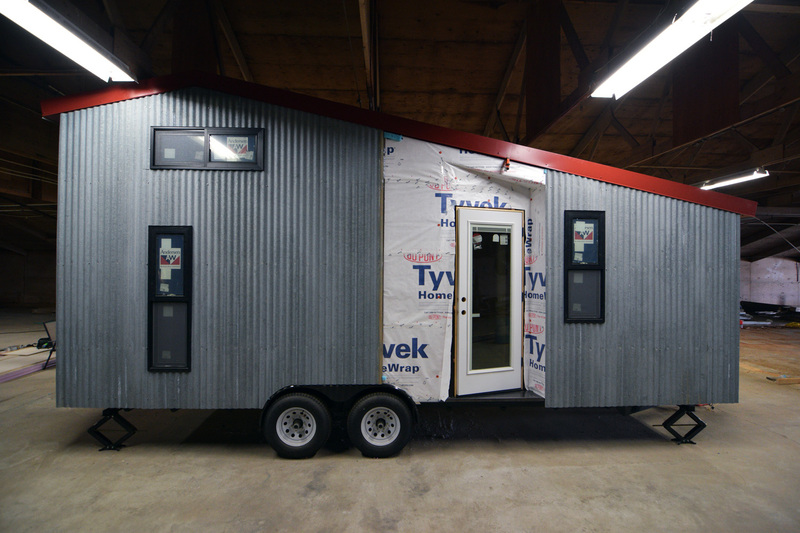 2’x12’ 80 year old corrugated metal panels cover a lot of square footage so one might think it would go much faster than installing many smaller wood planks. The reality is that we have to carefully measure out all of the windows, wheel well curves, doors, and angled top before transferring that information to each panel and carefully cutting the notches and angles out using a circular saw with a metal cutoff wheel on it, producing an immense amount of noise and showers of hot metal sparks. A miss measure or cut here could waste an entire panel and significantly add time. The “trouble” has been totally worth it in our eyes however as we stepped back after a long first day and fell in love with the 80 year old matte grey patina on what has become an extremely functional siding material. It has very few seams yet can function similar to a rain screen cladding by using the vertical air gaps for water to drain out the bottom or evaporate out the top. Additionally, In conjunction with our roof and metal undercarriage flashing, SHED is encased in a non-combustible protective envelope in a year where wild fires and their traveling embers are on many of our minds. 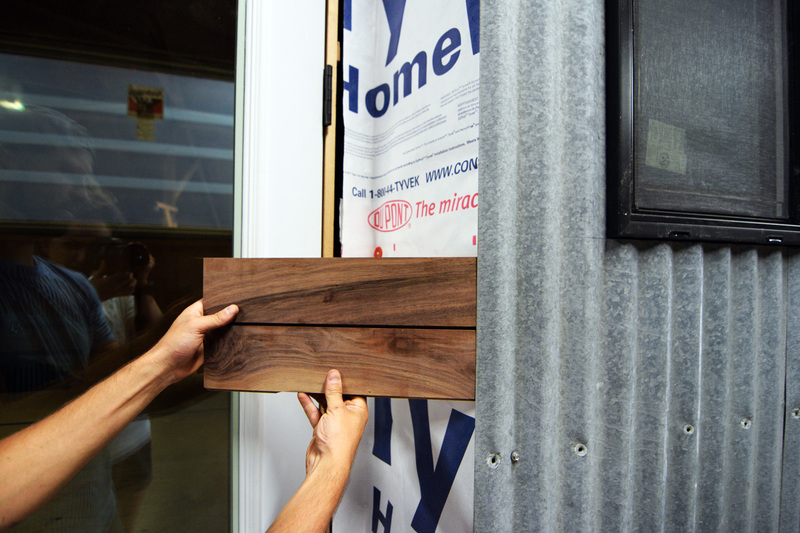 Lastley, a Sneak peek at our intended entry alcove siding material! See ya’ll in a couple weeks! You guys are rocking this.